In his final budget address, Gov. 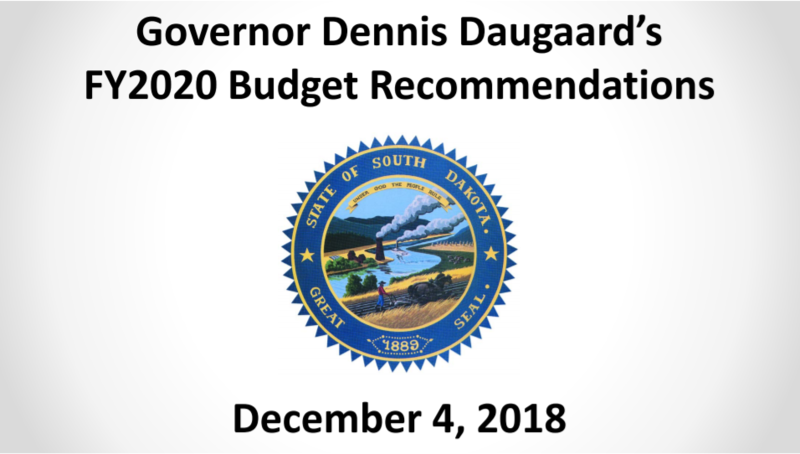 Dennis Daugaard proposed schools receive a 2.3 percent increase in state aid for Fiscal Year 2020. The proposed increase in state aid meets the statutory requirement of schools receiving the Consumer Price Index (CPI-W) or 3 percent, whichever is less, as CPI-W came in at 2.3 percent for the fiscal year. “We’re grateful to Gov. Daugaard for the proposed increase,” ASBSD Executive Director Wade Pogany said. The proposed increase would require $9.4 million in ongoing dollars be added to the state budget, which will be voted on by legislators during the 2019 legislative session, beginning on Tuesday, January 8. Pogany noted school board members and administrators will need to be on the frontline advocating the funding increase be followed, as the ongoing funding requirement will be heavy investment by the legislature. “We need school leaders to contact their legislators and advocate to them to provide schools what’s required in law,” Pogany said. “Schools need those added dollars to keep up with their teacher salaries and other costs they have,” Pogany said. Click here to download a list of which legislators represent which school districts and click here to find their contact information. During the upcoming legislative session you can stay up-to-date on all that occurs through the ASBSD Blog, Twitter feed, Facebook page and Bill Tracker.